In the tradition of Iron Lung every recording we do has to have Artwork. Sbilts records every gig and makes a cover for the CDR. 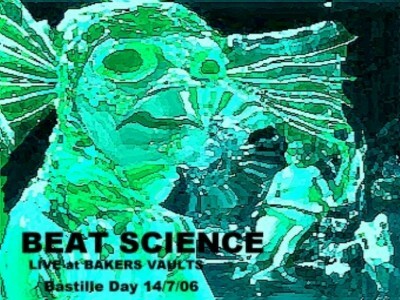 This is one for our Bastille Day gig last year. In the days of Iron Lung the tape covers were tres elaborate involving collages and cut ups with cartoons and splattered paint (there were too many art students in the band perchance?) The cardboard reel to reel tape boxes lent themselves to be scrawled over. Its easier to do things now with computers but less fun.